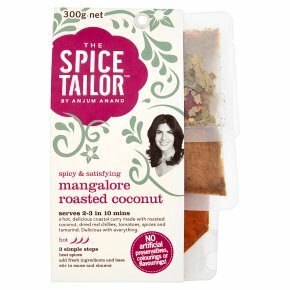 A spiced Indian curry sauce with roasted coconut and spices in individual pouches. Chilli rating - hot - 3. Spicy & satisfying. Serves 2-3 in 10 mins. No artificial preservatives, colourings or flavourings! Suitable for vegetarians. A hot, delicious coastal curry made with roasted coconut, dried red chillies, tomatoes, spices and tamarind. Delicious with everything. Our Mangalore Roasted Coconut Curry is based on one of their favourite dishes, known as ghassi. It layers onions, tomatoes, ginger, garlic with blended roasted coconut, red chillies and a tang of tamarind. The resulting flavours are complex and delicious and explains why Mangalorean food is now gaining such popularity across India. The Spice Mix Dried curry leaves for aromatic warmth Whole red chilli for clean heat Sauce Facts Mangalore is a coastal region in Western India. It is probably best known for its delicious, complex seafood curries often typified by ground roasted spices, coconut, tamarind and deep red Mangalorean chillies. This curry is from the Bundt community. Their cooking can be very complex with many steps to achieve those much-loved layers of flavours. Although seafood features prominently in this cuisine, this curry is also made with chicken and vegetarian versions often with chickpeas. It also works with pork, lamb, aubergine, mushrooms, okra, cauliflower, eggs and much more.